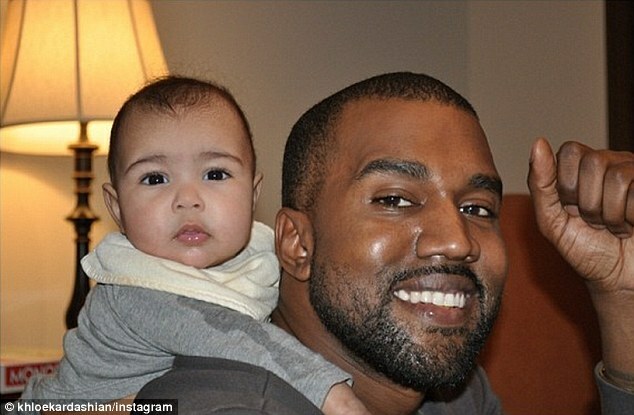 SO CUTE: FIRST PHOTOS Of Smiling Kanye West And Daughter Nori! Khloe Kardashian, Kim Kardashian’s sister, has recently shared a snapshot of her brother-in-law-to-be Kanye West giving his seven-month-old daughter North a piggyback ride. “Proud of what an awesome daddy Yeezy is. #DaddysGirl #Family,” Khloe tenderly wrote in a caption accompanying the photo. Kim Kardashian says the snap of North riding on her dad Kanye’s shoulders was taken during an “intense Monopoly game” while they were vacationing in Utah, United States. The reality star also shed some light about what it feels for her to be a Mother to a the seven-month-old daughter. Asked whether she had always wanted to have children, the 33-year-old admitted she “always wanted about six”. Kim then shared two more photos from the day before, when she was trying on cute bow headbands on the photogenic youngster. “She doesn’t wear a lot of bows and my niece wears so many headbands, so I was trying all these bows on her and she really liked them, so I think she’s going to start wearing some bows,” she explained. Previous articleExclusive: Michelle And Barack Obama To Divorce? Next articleBafana Goalkeeper, Khune, a Major Doubt for Eagles Clash.